Warsaw - UEFA on Thursday said that it had fined Germany €10 000 after their fans threw missiles onto the pitch during their opening Euro 2012 match with Portugal. Portugal were fined €5 000 for a delayed kick-off to the second-half of the Group B match in Lviv, Ukraine, last Saturday, European football's governing body said in an e-mailed statement. Germany won the match 1-0. 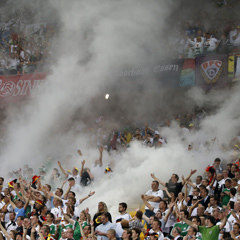 The fine imposed on the German football association (DFB) is small in comparison to the €120 000 imposed on Russia after their fans lit and threw fireworks during the game with the Czech Republic last Friday. Potentially inflammatory "Russian Empire" flags were also spotted at the match in Wroclaw, southwest Poland, which Russia won 4-1. Russian fans were also blamed for an attack that left four volunteer stadium stewards requiring hospital treatment. UEFA threatened to deduct six points from Russia's next European championship qualifying campaign if there were any repeat of the crowd trouble.